The Queen’s Awards for Enterprise are the UK’s most prestigious business awards, given only to companies or individuals who are outstanding in their field. Previously known as the Queen’s Awards to Industry, the first Awards were given in 1966.
International Trade: Winners demonstrate that their business has achieved substantial growth in overseas earnings and in commercial success (for their business size and sector) through either outstanding achievement over 3 years or continuous achievement over 6 years. Innovation: Winners demonstrate that their business has substantially improved in areas of performance and commercial success by either outstanding innovation, continued over at least 2 years, or continuous innovation and development over at least 5 years. Innovation achievements are assessed for: invention, design or production; performance of services and products; marketing and distribution; or after-sales support of goods or services. Sustainable Development: Winners in this category demonstrate commercially successful products, services and approaches to management which have major benefits for the environment, society and the wider economy, either by outstanding advance over at least 2 years or continuous achievement over 5 years. Sustainable Development achievements are assessed for: invention, design, production, performance, marketing, distribution, after-sales support of goods or services; or management of resources or people and relationships with other organisations (or their representatives). Businesses can enter more than one Award category as long as they meet the criteria. Social Mobility: Winners demonstrate that their business has had a social mobility programme running for more than 2 years and can prove that the programme benefits the organisation financially or otherwise (for example, it has improved your reputation or led to savings in the business). 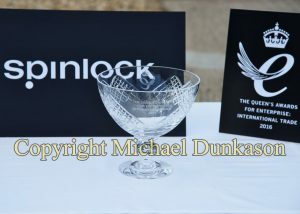 In 2017, Spinlock were again recognised for their achievements and were awarded The Queen’s Award for Enterprise: Innovation. Click here to read Spinlock’s recent announcement. In 2016, Spinlock were awarded The Queen’s Award for Enterprise. Claire Locke was also awarded The Queen’s Award for Enterprise Promotion in 2016 and was one of only five individuals to receive this award nationally. This was in recognition of her work championing Island enterprise and working with young people to start their own businesses. Mr Adrian Medley DL, Mr John Owen CMG MBE DL and Mrs Claire Locke DL are responsible for promoting applications for The Queens Award for Enterprise. Please contact Mrs Gillian Phenix at the Lieutenancy Office or click here for further guidance.